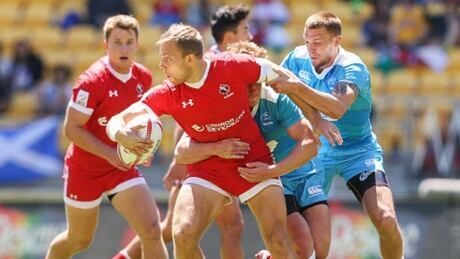 The Canadian rugby sevens team were a convert away from keeping their Olympic hopes alive. Instead, a devastating 14-12 loss to Russia meant the end to Canada's Olympic dream. The Canadian men's rugby sevens team will not be heading to the Rio Olympics in August after falling to Russia in a last-chance qualifier on Sunday in Monaco. Canada remains in the hunt for the final place in the Olympic men's rugby sevens field but will have to take a more difficult route to get there Sunday after losing 21-19 to Germany in Monaco. Rugby Canada announced the men's sevens team that will compete this weekend with one spot at the Olympics on the line. 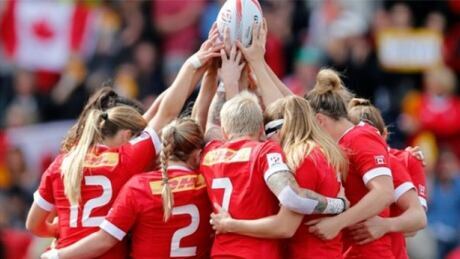 Canada's women's sevens team has advanced to the Clermont-Ferrand Sevens quarter-finals after finishing Day One second in Pool B with a 2-1 record. The Canadians opened Saturday with two wins over Japan and Russia before falling to New Zealand in their final match of pool play. Canada's men's rugby sevens team has one last chance to qualify for the Rio Games. In order to do that, they'll need to outlast 15 other teams at a tournament in Monaco who are vying for a single berth at the sport's reintroduction to the Olympics. You are currently browsing the archives for the Sports/Olympics/D3 Rio 2016/Rugby category.